This in the digital Screen We Trust attitude with anything digital may be your great downfall. Simply, because you/we have no idea what's going on behind it. Goodman addresses many issues concerning digital technology and its sometimes extra-legal uses. No doubt there are benefits to using digital this and digital that (Internet of Things) but like everything there is this other side that if you're not careful (over confident, cocky and/or ignorant) will reap much havoc in your life. And, when you invite them in (C'mon down!) Goodman will astound you with the damage that can be done and in many cases irreversible. Strongly Recommended! From former FBI Futurist, Interpol advisor and beat cop Marc Goodman, a deep dive into the digital underground illuminating the alarming ways criminals, corporations, and even countries are using new and emerging technologies against you—and how this makes everyone more vulnerable than you ever thought possible. With explosive insights based on a career in law enforcement and counterterrorism, leading authority on global security Marc Goodman takes readers on a vivid journey through the darkest recesses of the Internet. He explores how bad actors are primed to hijack the technologies of tomorrow. 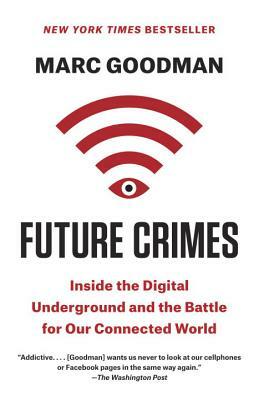 Provocative, thrilling, and ultimately empowering, Future Crimes will serve as an urgent call to action that shows how we can take back control of our own devices and harness technology’s tremendous power for the betterment of humanity—before it’s too late. "You couldn't ask for a better [cyber risk] overview than Future Crimes." "Utterly fascinating stuff...Goodman weds the joy of geeky technology with the tension of true crime. The future of crime prevention starts here." "By the middle of the first chapter you’ll be afraid to turn on your e-reader or laptop, and you’ll be looking with deep suspicion at your smartphone...[Goodman's] style is breezy but his approach is relentless, as he leads you from the guts of the Target data breach to the security vulnerabilities in social media...Mr. Goodman argues convincingly that we are addressing exponential growth in risky technologies with thinking that is, at best, incremental.